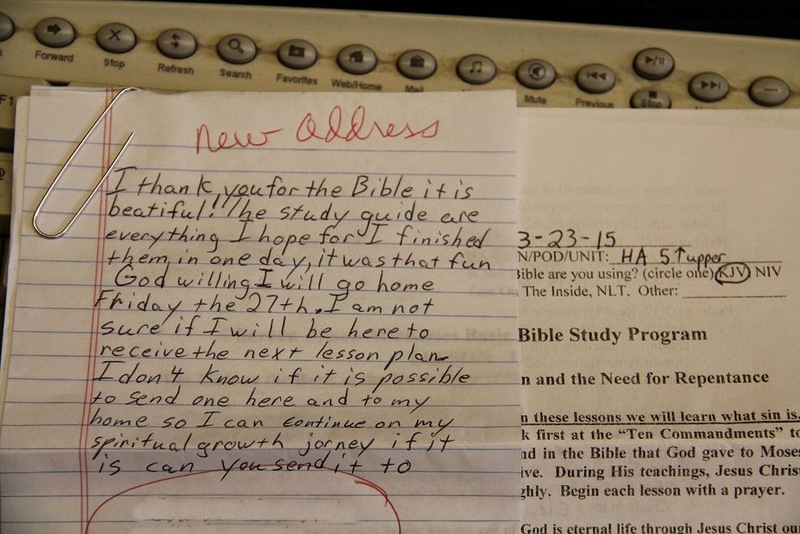 Berean Prison Ministry: Party or Work? Yesterday we had another big day for Berean. Mark remarked, "that didn't sound like you were working, it sounded like a party in that room." He was half right. We were having a good time but the work didn't stop. 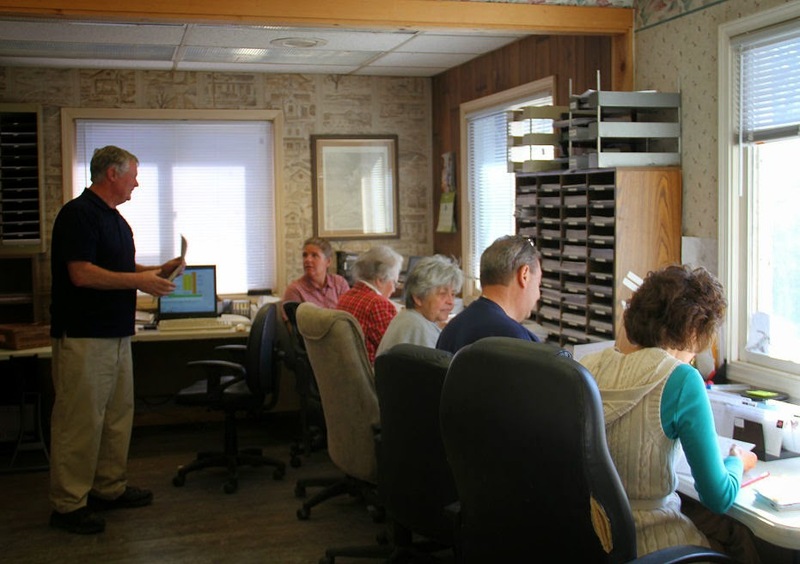 Above everyone is hard at work, below a check came in from Lincoln Correctional center. This is always amazing to us. 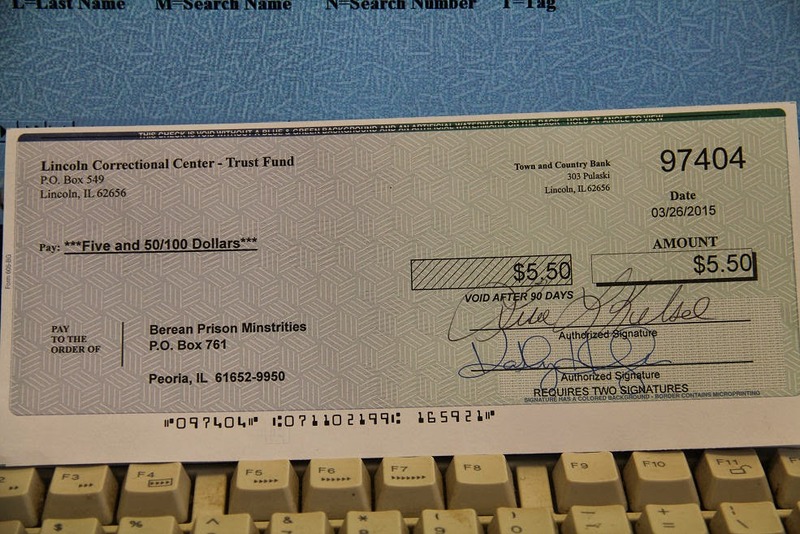 This is actually a tithe check from an inmate. They get paid pennies on the dollar and instead of spending it on something at the commissary to make their life or cell a little better will send it to us. 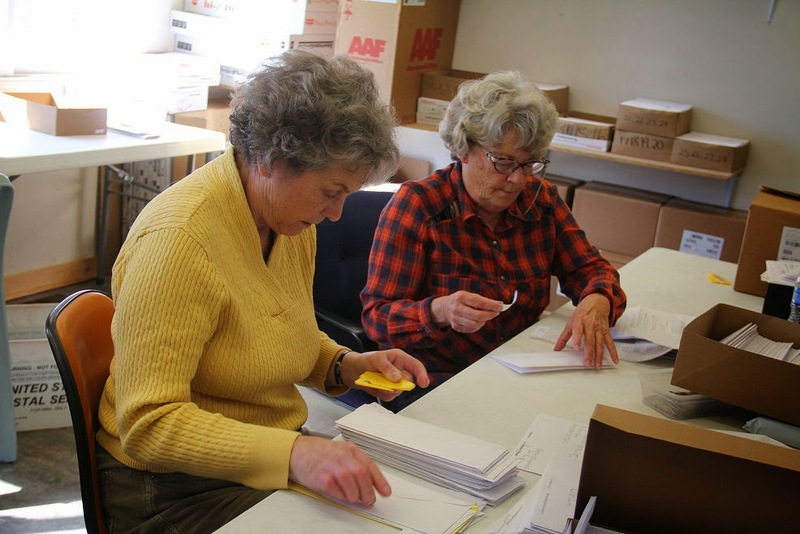 Above Jan is opening letters and reading them while Joyce is applying labels to studies for mailing. Below is just a nice thank you letter with a new address. Above we have the Bible line. David is getting the Bibles for us and putting them on the table then each lady has a job to do. 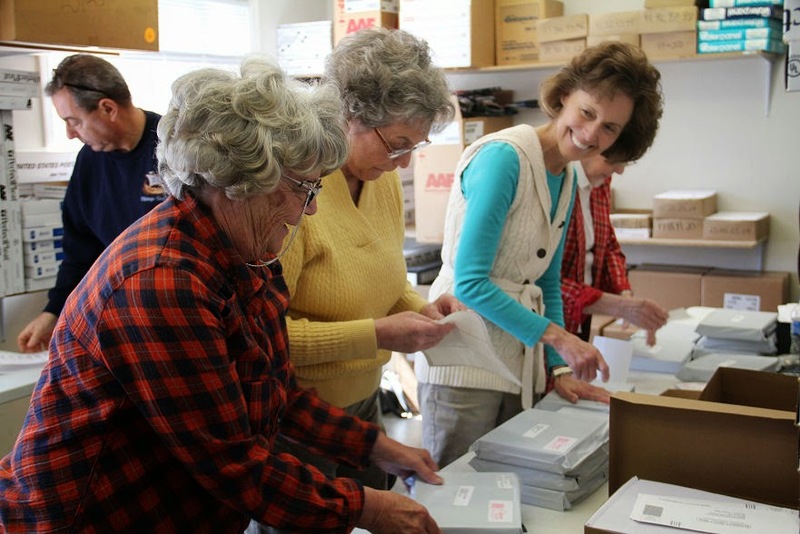 Eva Jean has the return address, Kathy is applying the prisoner label, Jan is applying the postage while Joyce is stacking them back in the boxes for loading. We broke for lunch at noon. 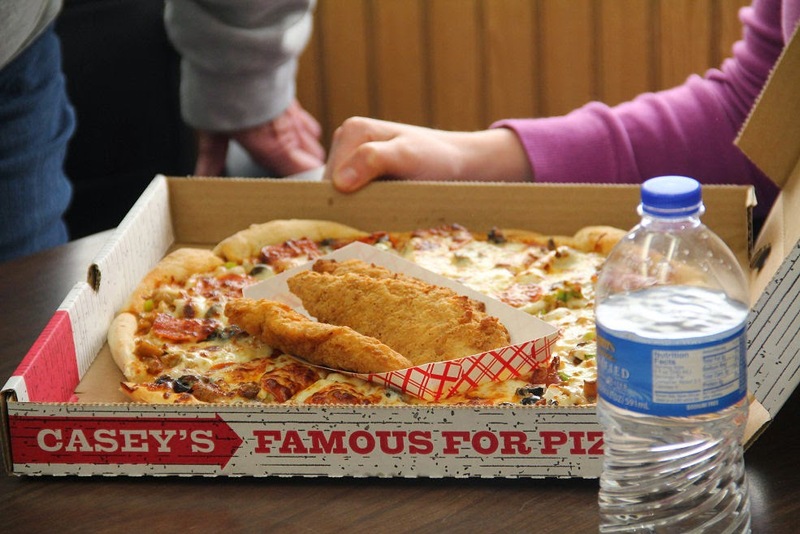 Emily picked up pizza for everyone from Casey's but also picked up a few chicken tenders to share just in case someone didn't want pizza. Then it was back to work on the Bible line. Check out those boxes below, David and Emily were busy hauling them into Diane's van for the trip to the post office while the ladies finished getting them processed. We emptied about every box again and mentioned, Rachel is going to be mad Thursday when she comes in but then remembered Rachel is down in Gulf Shores, Alabama. Who is going to fill all those boxes? If anyone has a few hours to donate to Berean we could sure use help on Thursday. The mailing isn't usually as big on Thursdays and that gives us time to prepare for the huge mail days we now seem to get each Tuesday. Please please consider coming. We meet at the Meister Companies 711 S. Kickapoo Creek Rd, Peoria, IL 61604 at 9:00 am. We would love to have YOU!